On 8 October a special report was released from the Intergovernmental Panel for Climate Change to highlight the impacts of global warming of 1.5oC above pre-industrial levels. The report is substantive and is led by 91 authors drawing upon inputs of over 2000 experts, nearly 500 reviewers and citing 6000 papers. The report is set in the context of the Paris Climate agreement in 2016, which aspires to keep global temperature rise to less than 2oC this century and to pursue efforts to limit the temperature rise even further to 1.5oC. What has been unclear is how long have we got until we reach this warmer climate and what are the likely consequences? The report assesses how a 1.5oC warmer world compares with a 2oC warmer world. Drawing upon climate model projections, there are robust differences in regional climate between a 1.5oC and 2oC warmer world: the mean temperature and extreme temperatures are higher for a 2oC world (high confidence) and there is heavier precipitation in some regions and drought in some other regions (medium confidence), and that there is an extra 10cm of sea level rise, affecting 10 million more people. The effects on the habitat are viewed as alarming with twice as much habitat loss for plants and insects for 2oC warming compared with 1.5oC warming. Warm-water corals are effectively wiped out with a 99% loss for 2oC warming, while 10% might survive with 1.5oC warming. Arctic sea-ice free summers are viewed as being once every 10 years with 2oC warming, rather than once every 100 years with 1.5oC warming. There are real benefits to acting sooner to limit the increased warming of the climate system. What is needed is to reduce the amount of carbon emissions and the resulting amount of carbon dioxide in the atmosphere. Proposed solutions include reforestation, a shift to electric transport systems and development of carbon capture. The challenge is severe, we need to reduce global carbon emissions by 45% from year 2010 to 2030. We can only achieve this goal by keeping as much carbon as possible in the ground and not releasing further fossil fuels. Meeting this challenge will be demanding. OSNAP! There goes the tip of the iceberg! When you decide to study the currents that whip past the continent of Greenland and that transform the waters in the Irminger and Labrador Seas, an oceanographer must be willing to make peace with an ocean that isn’t entirely liquid. The extreme elements that shape the rocks along the Greenland coast also actively chisel away at the hundreds of glacial termini that meet the ocean edge. This chiseling leads to a constant flux of icebergs, small icebergs called bergy bits, and even smaller ice chunks called growlers. With ice in its various sizes and jagged shapes breaking away from the entire continent, the currents in the OSNAP region transport and mix more than just water. Logistically, the OSNAP study region is one of the hardest places in the world ocean to successfully execute fieldwork. To start, the East Greenland Coastal Current, the East Greenland Current, and the Irminger Current can flow at speeds well over 1 knot as they round the tip of Greenland. In addition to strong currents, the area is home to a record: the windiest place in the world ocean. Simple ship maneuvering tasks, such as holding station while collecting data or recovering moorings (Figure 1), become challenging for the mates on the bridge as unforgiving winds build up rough seas that are already swiftly flowing. Floating ice is quite literally the icing on the OSNAP cake. Ice adds a whole new dimension, and phase of matter, to navigation and operations at sea. From a distance, it can be nearly impossible to decipher ice chunks from whitecaps and sea spray. Large icebergs can be easy to see if they express above the surface of the ocean, but the majority of an iceberg’s mass lies below the sea surface and is difficult to see. Ice can also block access to nearby fjords used for shelter in severe weather. These navigation dangers keep the R/V Armstrong mates on high alert at all times as they steer through storms, darkness, and thick fog. In order to help navigation efforts, WHOI researchers employed the help of the Danish Meteorological Institute (DMI), which specializes in satellite sea ice imagery. 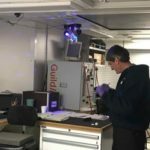 DMI is able to provide the ship with updates on the location of ice based on satellites that take Infrared (to see through clouds) and visible images of the Earth’s surface. Not only is this information extremely helpful, the maps can be stunning. 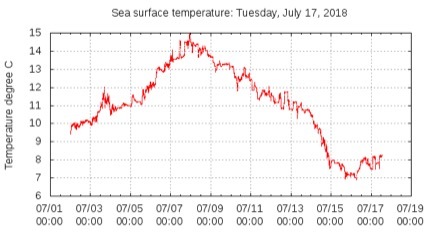 Ice information from our current OSNAP cruise (on September 9th) is shown in Figure 2. This satellite image from the southern tip of Greenland is an example of how satellite-detectible ice features disperse from their mother fjords into the surrounding ocean. Ice can also run into the OSNAP moorings, pushing instruments out of the way, or even snapping them off their lines making it impossible to recover them and their precious data. Our six shallow moorings on the continental shelf were, in fact, designed with drifting ice in mind. Equipped with a tripod-like structure at their base, these moorings have most of their instrumentation mounted near the sea floor. 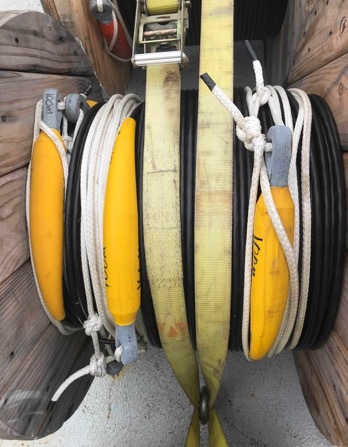 In an attempt to capture shallow data, the moorings also have special tethers extending up from the tripod base with weak links to top flotation. These weak links are designed to break easily should an iceberg snag the line, with the break point located strategically below the flotation and above an instrument. In the event of tether breakage, the instrument sinks to the bottom, but remains attached to the rest of the mooring so that it can still be recovered. Figure 3 shows a depiction of this breaking process. Of the recovered moorings from this year’s cruise, three of the six shallow moorings had their top floats ripped off within less than a year! With all of the challenges handed to us from ocean elements, our crew has excelled in accepting the challenges brought on by ice. Of all 16 moorings that we aimed to recover on this cruise, all have successfully come back. In the face of extreme weather and rough seas, we have completed over 240 profile measurements of ocean temperature, salinity, and velocity thus far. And through all of these challenges, no one can deny how much they still enjoy seeing the Greenland coast in full panache with its towering and craggy icebergs. Figure 1. An iceberg off the stern of R/V Armstrong during a tripod mooring recovery during the current OSNAP cruise. Figure 2. Denoted infrared satellite imagery courtesy of the Danish Meteorological Institute. 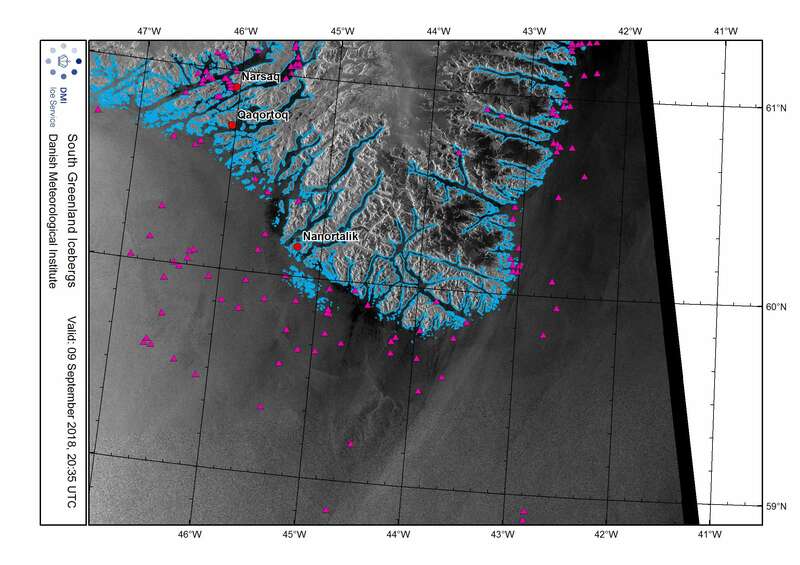 Pink triangle indicate the position of satellite-identified icebergs throughout the southern Greenland region. Figure 3. Illustration of the OSNAP tripod moorings with weak links to top flotation. 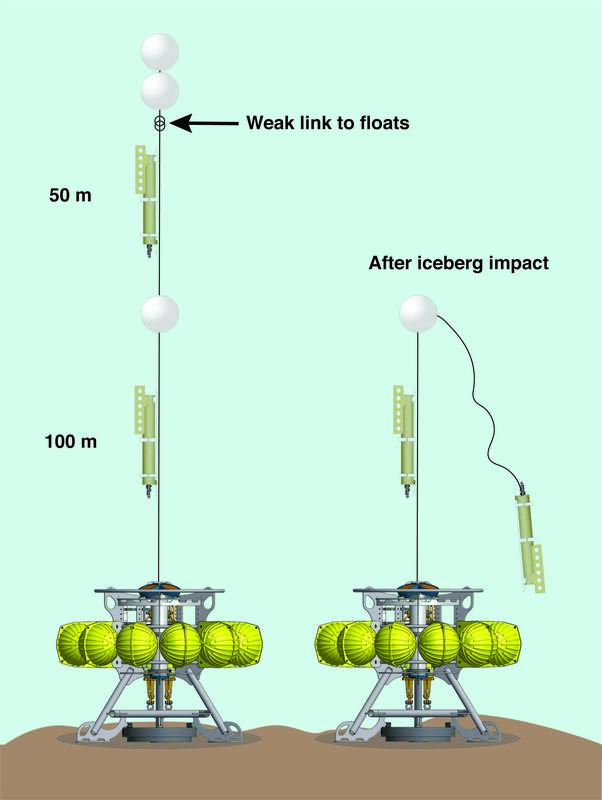 The left mooring demonstrates a normal deployment, while the right mooring shows a deployment with interference from an iceberg. In the event of an iceberg snagging the upper mooring tether, the top floats are released and the shallowest instrument falls, while still remaining connected to the mooring. Today we steam for Iceland. After four weeks of mooring operations and CTDs even those among us who are always looking for more data are ready to go home. Part of it is mindset, we were prepared to work ourselves to the ground for four weeks to get this done and now it is done. Had we set out for six weeks I’m sure we would have continued tiredly, but motivated for another two weeks. During these four weeks we recovered 19 moorings and deployed 19 new moorings in those same positions, plus one lander. The mooring teams of NOC, RSMAS and NIOZ worked together on each of these moorings. So while the PIs of the respective institutes had a break while another PI was overseeing his or her moorings, these guys worked continuously. From my workstation, which faced the CTD console with its many screen, I could nicely keep track of the progress on deck. While I was out there doing my own moorings it was good to have some more experienced people around who don’t panic when a mooring comes up in a tangle (oh, how I would have like to start recovering the line that held the instruments/data first…). the screens of the CTD console. Keeping and eye on all the important stuff, position, ETA, CTD and deckwork. 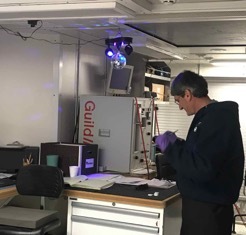 But while we still had three watches, each covering eight hours of CTDs, the chemist team had to deal with 24 hour measurements with two people. So maybe it’s not too surprising I haven’t seen them much since they finished their work and were allowed to recover. I’m sure they’ll come out of their cabin once we get closer to Reykjavik. At least we get to go home in a few days. Most of the Armstrong’s crew are staying on for another cruise. They have been very helpful and accommodating in our busy schedule and we’ve explained them the difference between the colored jerseys in the Tour de France. There was one unfortunately incident, where one crew went on a killing spree (playing the assassin game), but to be honest that whole thing was instigated by the some of the British participants. All of us came together in our loathing of “weather” on this, somewhat lively, ship. An incoming wave attacked one of the folks attaching microcats to the CTD frame, they nearly lost one of the cats when were holding on (not quite) for dear life. A ladder of an upper bunk bed came off in the middle of the night and woke up the owners of the bed as well as those in neighboring cabins. After all, there is a reason why we spend our summers in the subpolar gyre… we would never have managed doing all of the above in winter. That time of year is much better spend analyzing all the data we collected, maybe next to a cozy fireplace. Stuart, Roos and James discussing the latest plots of our section. Its the 2018 OSNAP field season and we are aboard the R/V Neil Armstrong, the new pride and joy of Woods Hole Oceanographic’s fleet. Pictured below is the R/V Armstrong coming into dock in the old harbor of Reykjavik, Iceland after completing two days of loading in the “new” harbor down the quay. This is my first time on the R/V Armstrong and I have been looking forward to sailing on her ever since she came out of the shipyard. The R/V Neil Armstrong coming into dock in Reykjavik, Icleand. The cruise has gotten off to a good start and we are now about halfway through our month-long voyage. We have three science groups aboard, from the U.K. (the Scottish Association for Marine Sciences and the National Oceanography Centre, led by Dr. Stuart Cunningham), from Holland (the Royal Netherlands Institute for Sea Research, led by Dr. Femke de Jong), and from the U.S. (the Rosenstiel School of Marine and Atmospheric Science, University of Miami, led by myself). We have a lot to accomplish on this cruise, and it still boggles my mind how many mooring operations we are planning to do on this one cruise. Altogether we have 21 moorings to recover and 19 to deploy, most of which are mooring “servicing” operations, meaning that we recover and redeploy a replacement mooring at the same site, usually on the same day. The deck is full to the bulkheads with mooring gear, and many of the crew have commented that they have never seen the deck so full. Thanks to the ingenuity of the deck crew and mooring teams we managed to find a place for everything (whereupon I can now admit that I was secretly worried whether we would actually fit everything onboard!). The array of moorings to be serviced on the OSNAP East 2018 cruise. 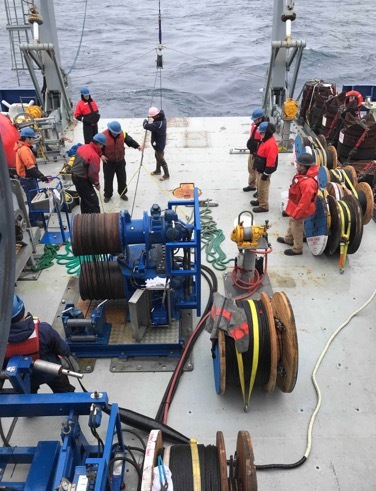 In addition to the mooring operations, we plan to complete a full line of CTD stations across the entire array, amounting to some 80 stations in total. 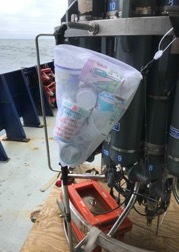 At these stations we will be measuring full depth profiles of currents, water properties (temperature, salinity, and dissolved oxygen), and also drawing water samples for chemical analysis including dissolved inorganic carbon, nutrients, and nitrogen and silica isotopes. 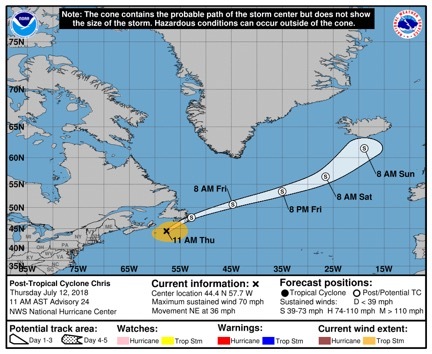 So far we have had very reasonable working weather, except for having to dodge the remnants of tropical storm Chris which came barreling through our array right where we happened to be working at the time. So, we picked up and ran to the far western end of our line to resume work there, forcing us to develop a new “Plan B” that reorganized the entire layout of the cruise. Such is life at the mercy of the sea. I find it ironic that during the four OSNAP cruises I have been on since we started the program in 2014, the worst storms we have had to deal with have all come up from the tropics as post-tropical storm events. So much for my plan of escaping from the summer storm season in Miami. The last 5-day forecast for post-tropical cyclone Chris posted by the National Hurricane Center. The storm position on Saturday July 14th was right where we planned to be working at the time. Needless to say we decided not to stay around to see if the forecast track was correct. 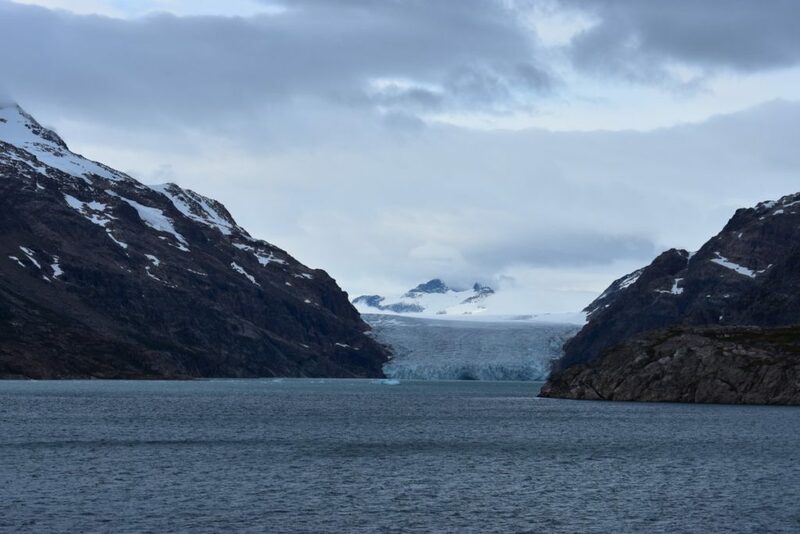 One of the truly remarkable things about these OSNAP cruises – and in particular the part of the subpolar North Atlantic that we are crossing during this cruise – is that you can feel in your skin and bones just what effect the ocean circulation is having on the climate. Part of our cruise takes place on the “warm” side of the subpolar gyre, where the North Atlantic Current brings warm waters originating from the Gulf Stream to Rockall Trough off the coast of Scotland and to the eastern side of the Iceland Basin. This is the most looked forward to part of the cruise, where ocean temperatures are as high as 14 degC and surface air temperatures rise to match it. A look out the back door to the deck often finds people who are off watch milling about aimlessly, squinting in the warm sunlight and enjoying the beauty of the sea. 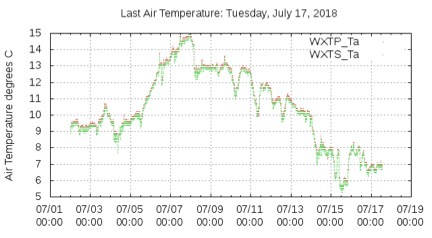 Then, eventually, whether we like it or not, its time to cross westward into the western Iceland Basin and Irminger Sea, where air and water temperatures are more like 6-8 degC. And fog is almost everywhere. Suddenly you don’t see anyone on deck anymore unless they have to be. 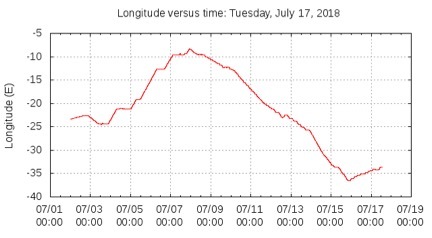 The graph below shows the longitude along our track and the corresponding surface air and water temperatures. 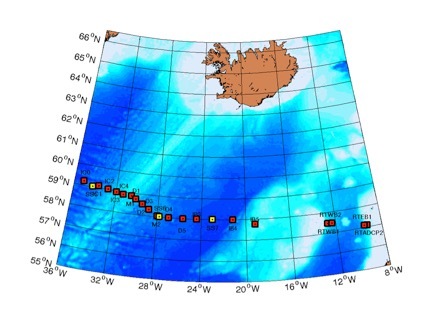 We started in the central Iceland Basin near 25 degE and first worked our way over to the coast of Scotland (~July 8th) and then headed back across the Iceland Basin and into the Irminger Sea where we are now. Just remarkable how similar these three curves are. We have an outstanding group of scientists on this trip, and I would like to highlight here especially the fantastic group of students who have joined us and are contributing greatly to our mission. The pictures below show them hard at work on their various watch duties, seemingly enjoying the experience (or at least faking it really well). 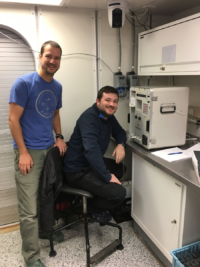 Graduate students Roos Bol from NIOZ (left) and James Coogan from SAMS (right), at the CTD computer console. 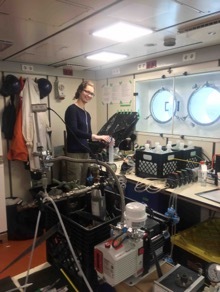 Below are some other assorted photos from the cruise showing the science labs and work taking place on deck. 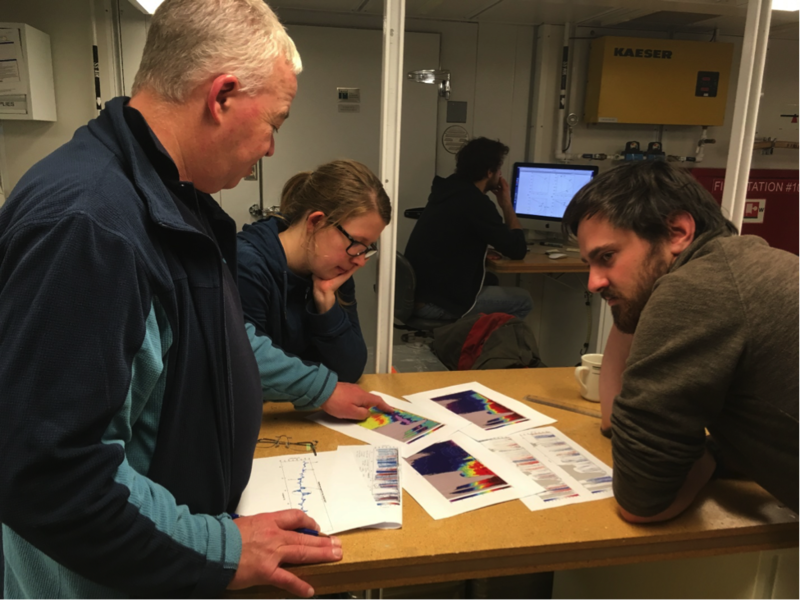 Over the past week we made great progress in our journey of the sea, surveying an eddy off the west coast of Greenland with repeated ADCP and CTD surveys to investigate in detail the structure and content of these dynamic water features. We also deployed 2 more APEX floats in the centre of the eddy. Johannes and Marie discussing the next Apex float deployment (credit: Sunke Schmidtko). During the last few days while we finished the Labrador Sea part of our cruise and had our mid cruise celebration, I had the chance to sort out my thoughts and go through notes of conversations with more of the people on board. One thing I realized is that I never mentioned the amazing crew and captain of the Maria S. Merian. Without their patience, experience and watchful eye neither the mooring work, nor our CTD stations would have gone as smoothly as they did. Besides doing a great job manoeuvring the vessel around always changing CTD station plans, the watch officers are always happy to have us come up to the bridge to say enjoy the sunset or answer questions about the many instruments on board. The watch officer during my CTD shift is 2nd officer Sandra Schilling and she has been on board the Merian for just under a year. I think it is amazing to see women in these leading roles and I am glad I got to meet Sandra on this cruise. I asked Sandra if she misses being on land, since 8 month of the year she spends at sea, but Sandra told me she feels happiest at sea and at the end of her time on land she always feels excited to be back on board for the next voyage. Apparently the coolest thing about her job is to navigate in unchartered waters. Pun intended! As the current week is coming to an end near the Cape Farewell, Greenland I am also ready to describe more of the great group of people I share this cruise with. I like interdisciplinary nature of our cruise. One of the scientists from Canada, fresh from finishing her honors thesis is Ciara Willis. Ciara described to me a lifelong passion for marine biology that started at age 4 inspired by conservation issues in Nova Scotia. 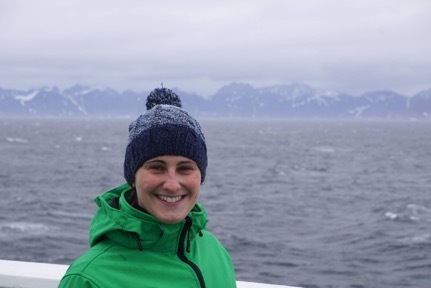 Ciara recently finished a degree in Marine Biology and Statistics in which she took part in projects in both Canada and the US and is now on this cruise sampling nutrients and vitamins from the CTD casts to investigate microbial activity in the sea as part of a research project at her University. Ocean microbes are poorly understood and hard to cultivate in laboratories. Because microbes have such a fast lifecycle and are at the origin of the food chain for all other large aquatic species it is key to understand changes in their habitat to adapt better to climate change. One of the cool features of microbes such as phytoplankton is that they are a source of oxygen in the water through photosynthesis similar to plants. I think it is amazing to think that microbes in the ocean can behave like plants on the surface of the earth. Ciara’s hobbies at sea include bird watching and reading. 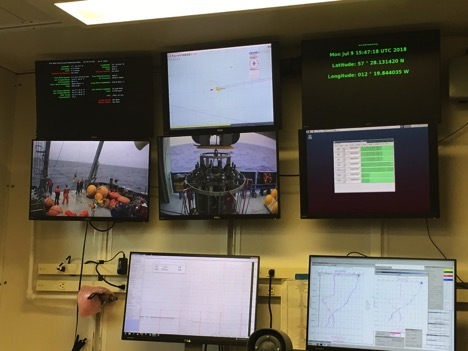 We are now closing in on the next and last part of our cruise which is to run CTD stations along Cape Farewell Greenland and then continue with the Eastern part of the OSNAP array, recovering moorings. The US research ship R/V Armstrong is also doing mooring recoveries in the vicinity and word has it we might even see each other in the coming days as a Rendevouz at Sea. Last December I already had the pleasure to visit this cool oceanographic research vessel and it will be exciting to see the ship in scientific action on the open seas! Men’s World Cup on the ship’s satellite television? Must be OSNAP time. It is still gray and cool outside, approx. 4C and 40F. But the rain is gone. I saw the sun reflecting off the ocean surface in a break in the clouds once this morning, the ocean surface is dark silver. Not the sun itself, just a derivative of the sun. I’ll take it. I have never been in the Irminger Sea this close to the southern tip of Greenland before; the ocean here seems more unpredictable than the Iceland Sea, where I have spent my last three OSNAP cruises. Just an impression – it seems like you need to watch your back out here. Water has been flat so far, though. So far. 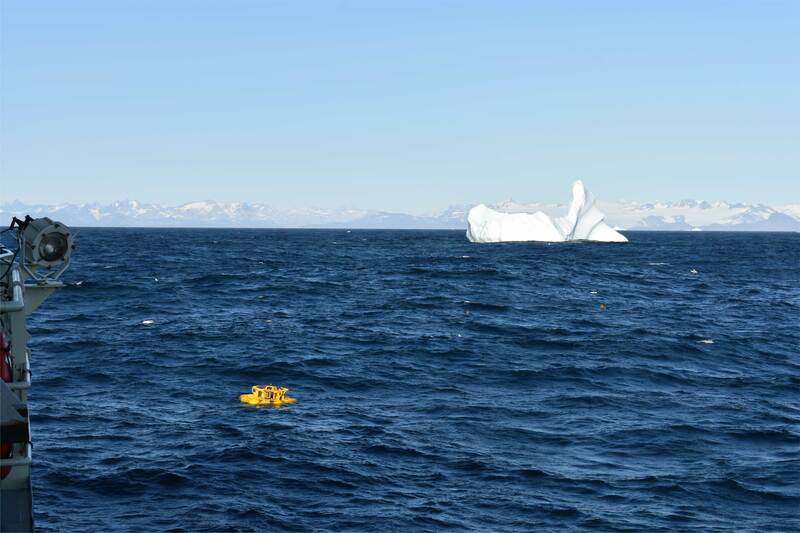 We deployed our first OSNAP mooring yesterday: M4, the farthest offshore mooring which just captures the outer edge of the DWBC off the east coast of Greenland. This is the second mooring I have had the satisfaction of deploying, and it is a great pleasure seeing a mooring put in the water in a calm, controlled, effective manner. One technique used by this mooring team is the use of a YaleGrip to transfer line tension or load off a partially payed out mooring line. A person might need to do this to move a wire from one winch to another, or to take tension off a wire to attach and inline instrument where the wire termination is not favorable to secondary shackles – let’s say at the end of an electrical-mechanical (EM) cable. I have never seen them used by any other mooring deployment group; it is possible I had not paid careful attention on previous cruises. A YaleGrip in the rigging van. The one pictured is the smallest we have out here, and is for the thinnest wire mooring cables. The color coding at the ends indicated the strength of the grip. 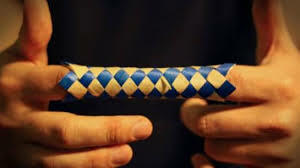 Yale grips work like ‘finger traps’, the children’s toy made of woven strips of paper overlapped into a finger-sized tube. Put a finger in each side, and try to pull them out … stuck! 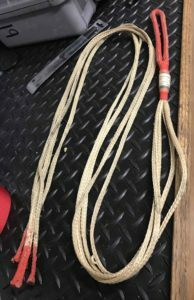 The grips are each a set of four Kevlar flat ropes that are wrapped around a taught wire. The grip begins with a loop (that can be later attached to a cleat or tie-off) secured in place with electrician’s tape. The loop end is located at the inboard end of the mooring wire, and the grip reaches toward the overboard end of the wire. Once the loop end is secured, the tension can then be slowly released from the original wire safely. A YaleGrip being used to transfer tension off the termination of an EM cable so that the inline instrument can be attached. This may sound dry in text, but to see it done in action is not. Once the loop of the YaleGrip is taped in place, two people send 1-2 meter lengths flying through the air in great arcs as the grip is put in place, wrapped around the mooring wire. It is an interesting contrast to see the highest of technical moorings still at the mercy of the old craft. As Jim Dunn puts it, “if you had a tug of war, the YaleGrip would win.” I just like the on-the-fly old school nature of the load transfer; it has a certain beauty to it. 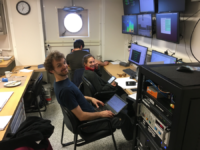 Johannes Karstensen and Penny Holliday, on the MSMerian, are on the east side of Greenland now, and the plan (at least as of 15:00 on 15 June 2018) is for the Merian crew to recover OSNAP moorings M1, 2, and 3 tomorrow. And we will follow in their wake on the 17th to begin deploying mooring in the same locations. Well, here we are again – in the middle of the gray raw North Pacific in June; must be OSNAP time! 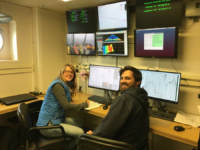 Amy Bower and I are the only OSNAP people on a ship full of Ocean Observatories Initiative (OOI) folks. But almost everyone on this ship is from WHOI. I will really miss sailing with Bill (Johns) and Stuart (Cunningham) and well, all the rest of the UMiami and SAMS crew, and sometimes the NIOZ crew, as I have done almost each year since 2014. Your shipmates become like family, and it was nice to have the same science crew together as we bounced from ship to ship each year. And I will miss seeing Rockall. This year, though, since the third and final seeding of RAFOS float deployments were completed in 2016, Amy and I are onto something else. The RV Armstrong is here primarily for the turn-around of the OOI Global Irminger Sea Array off the eastern tip of Greenland (http://oceanobservatories.org/array/global-irminger-sea/). 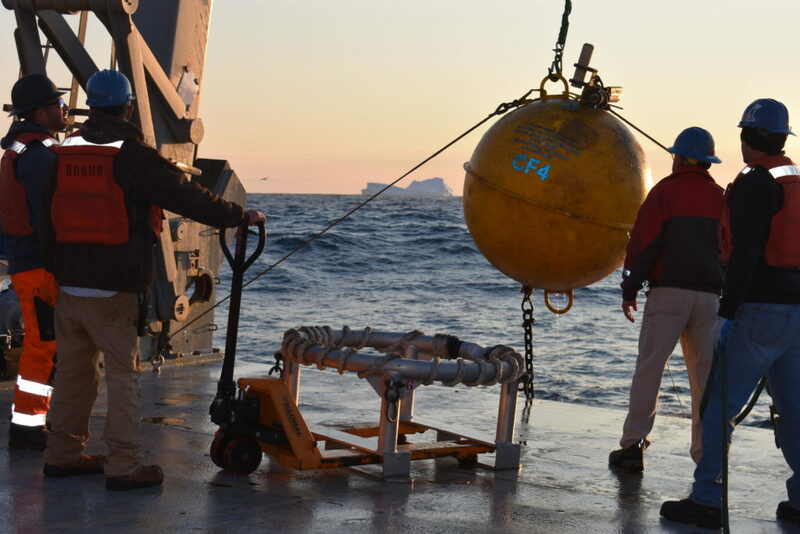 Amy arranged with the National Science Foundation (NSF) for four additional days of shiptime and mooring crew time to deploy four moorings for OSNAP east of Greenland, and also to recover two of the sound source moorings used for tracking the RAFOS floats. We took over this mooring array, instrumented with CTDs and current meters, from the UK as a swap: they took over some moorings in the Iceland Basin closer to their home country. Although this is a turn-around year for these moorings, we are only doing the re-deployment. 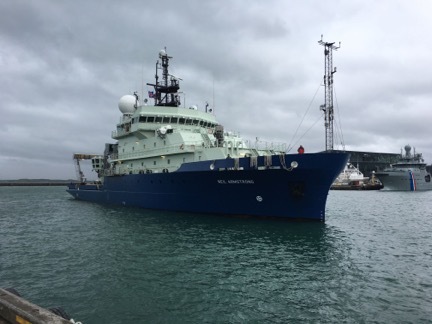 Johannes Karstensen and Penny Holliday, onboard the RV MSMerian, will recover the moorings that were deployed by Penny onboard the RRS Discovery in 2016. Johannes and Penny will be recovering at about the same time that we are deploying, and we will have to carefully coordinate our timing so that we do not literally get our equipment tangled up together. Stay tuned on that one. This cross-slope array will measure the properties and transport of the Deep Western Boundary Current which flows along the ocean bottom from north to south. The DWBC is composed of two primary water sources, the Denmark Strait Overflow Water (DSOW) and the Iceland-Scotland Overflow Water (ISOW). The DSOW is ‘newer’; its source is the dense (relatively cold and fresh) water that overflows the sill at the Denmark Strait, at the head of the Irminger Sea. Above it resides the relatively saltier and warmer ISOW, which originally came from the head of the Iceland Sea, in a similar deep overflow, but much farther upstream. Both are principal components of the subpolar overturning circulation. One thing I like about being at sea is learning new things; things that have nothing to do with sitting in a chair at a desk on a computer. 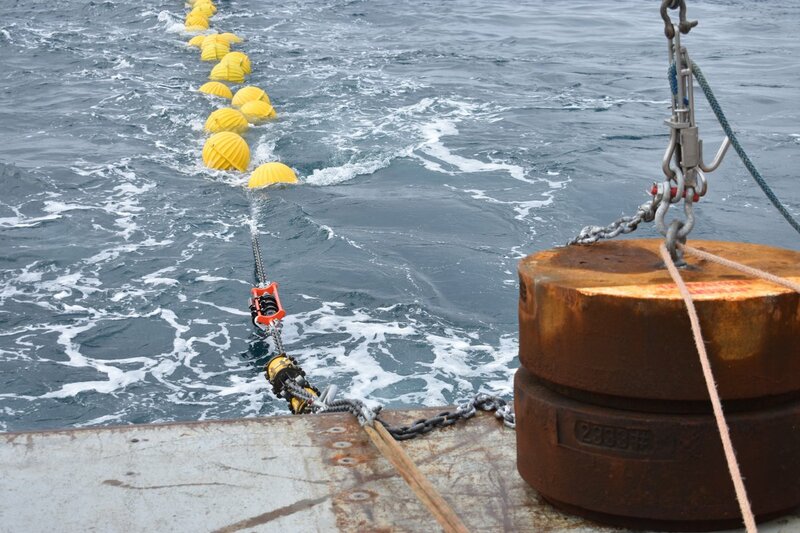 This morning were the first release tests for the surface mooring (SUMO) at the OOI Irminger Sea Array. 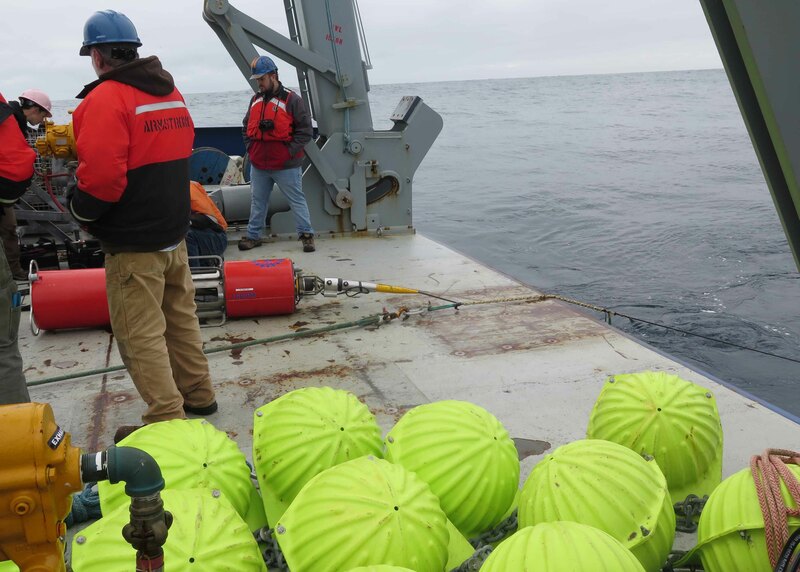 Talking with Jim Dunn, a salty mooring technician from WHOI, I learned that it is common practice for the OOI team to test releases by lowering them to 1000 meters depth on the CTD frame, and to let them sit for 20 minutes to get cold before doing the test. The release needs to be acclimated and under pressure to make for a good test. Seems like every group has a slightly different depth and duration for wet tests of the releases. Some groups do not do a wet test at all. I’ll plan to stick to the OOI protocol for our own mooring releases. 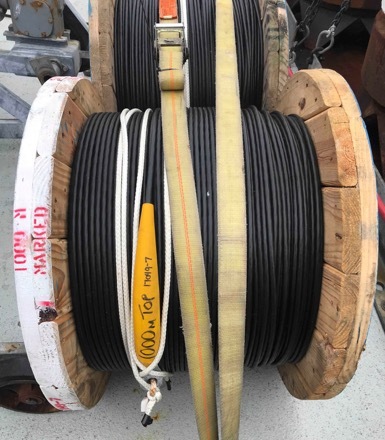 As well, I got a good show-and-tell from Jim Dunn and Meaghan Donohue, another salty mooring technician from WHOI, about how wire is wound on a reel with respect to the winch. On this ship, we have a Lebus winch, a double barreled winch where the barrels can be moved independently, at independent speeds, and also oriented differently from each other, or skewed, to control the spread of the loops on the reel – so they do not get tangled. The tension is controlled by the number of loops wrapped around the two barrels. Nominally there are six loops wrapped around the winch barrels as the mooring line and instrument are fed over the fantail into the ocean. After one reel of wire is spooled out, the wire is tied off, and the next reel of wire is moved into place. Instruments are put on the mooring either between the two wires, or clamped onto the wire itself. A more traditional winch, a “normal” winch, is a TSE winch – with a single barrel. The single barrel cannot have reels of wire fed to it, the wire tangles easily. This means that all reels must be carefully fed onto the single barrel winch before deployment. All segments, starting with the mooring bottom, are wrapped onto the barrel in order from bottom to top. Then, at deployment time, the line is payed out from top to bottom. This means that to deploy with a Lebus is generally twice as fast as deploying with a TSE. The two winches have one upstream difference: the wirerope or rope may be wound on the spools in opposite directions. This winding preference is correctable at sea, but it takes a long, long time to rewind spools of wire on a 3000 meter mooring, with the wire split onto many spools. And at sea, it is best to be prepared. Months before leaving for sea, I notified WHOI’s Rigging Shop that these moorings would be deployed on this ship with a Lebus winch. Our OSNAP mooring deployments are days off. This morning (Wednesday 06 June 2018) we went out to make sure the OSNAP mooring wire rope was wound on the spools correctly, and it was. Thank you, WHOI Rigging Shop. For the Lebus winch, the top of the wire is on the outside of the spool, and the opposite holds true for the TWE winch. If there are no instruments clamped to a wire segment, this wrap direction is inconsequential. But if the wire segment is ‘marked’, which means an instrument like a microcat will be attached with clamps to the wire, rather than being deployed in-line, the wirerope is taped at the correct depth where the instrument will be attached on the mooring. For this reason, marked reels need to be wound properly with respect to the winch used. Jim also told me that moorings are deployed anchor first in ice-covered water. Which I did not know and had never thought about. You can’t steam into anchor-over position dragging a mooring cable through the ice, like you do with a mooring deployment in open water. So in ice-covered water, the desired anchor position is where the mooring deployment starts. Which means the exact opposite holds true for the winch type and wire wrapping relationship if you have an ice-deployed mooring. What amazes me is that the same attention to detail needs to be paid to nearly every system set or tasks performed on a research cruise. I think it will be great sailing with this new group of folks. The Lebus winch in action, its two barrels slightly skewed. Meaghan and Jim are at the center of the action, along with ‘deck boss’ John Kemp. An unmarked reel – terminations are only labeled with shot length and the spool does not include ‘MARKED’ on the labelling. A marked spool. The cable termination is labeled ‘top’ and the spool is labelled ‘marked’.